Global overcapacity is coming to the synthetic rubber industry. Officials from the International Institute of Synthetic Rubber Producers have been trumpeting that warning for some time, and with good reason. In total, the IISRP lists more than 50 expansion projects worldwide covering polybutadiene, SSBR, butyl and EPDM. Some of those, though, may be on hold as expected demand increases in certain regions or product areas have yet to materialize. China, as expected, is responsible for many of the projects. It now accounts for 28 percent of worldwide SR capacity, compared with just 17 percent for North America. The nation apparently didn't consider the overall global picture when the government began sanctioning a large number of new SR plants, industry insiders maintain. For years, China had imported much of its SR needs, before deciding to become a producer on a major scale. That doesn't bode well for SR firms—such as those in South Korea—that added capacity, counting on the demand from China to continue escalating. 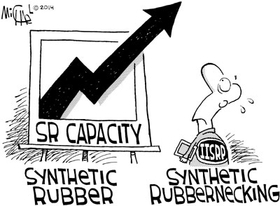 Those SR makers now need to find other markets for their rubber or run operations at well below nameplate capacity. China, though, isn't the only culprit. Other new capacity is going up in Europe and elsewhere in the Asia-Pacific region. In many cases, the rationale is that the SR capacity is following growth in the tire and automotive industries overseas. Of the announced projects the IISRP has tracked, only a handful are set for U.S. operations. The short-term impact of the supply/demand imbalance is apparent: operating rates are low and will continue to drop. One industry analyst said SSBR utilization rates are sagging below 50 percent. Pricing also remains depressed, which is something that will benefit rubber product customers for the time being. And the low current prices for natural rubber aren't helping, as any request for pricing relief from SR suppliers will just cause a quick shift to NR in many cases. Balance won't happen for a few more years, those in the industry forecast. Some of that will come from expected demand finally taking shape, along with a round of rationalization that will take some capacity offline. But until that happens, prices and operating rates will remain low, along with profit margins.